The Volkswagen Scirocco R is a very exciting sport coupe. We do not get it in America. Now, Volkswagen has upgraded its engine to make it the most powerful Scirocco ever. It will be an extremely awesome car for us to never drive. 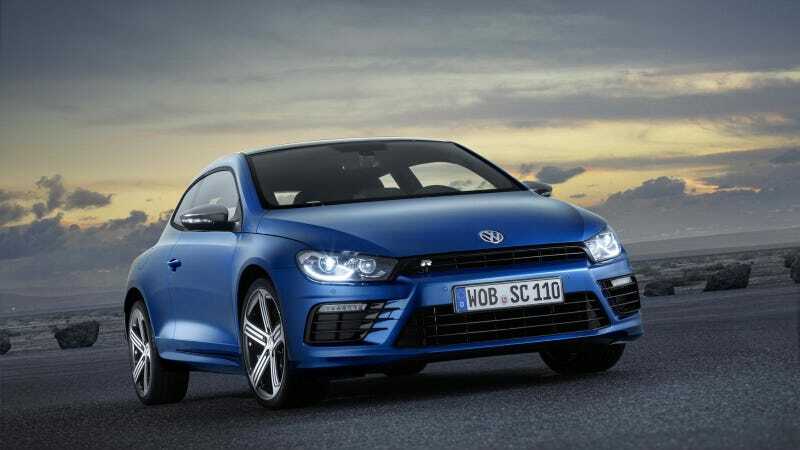 Volkswagen debuted the first Scirocco at the 1974 Geneva Motor Show, and now 40 years later, they're celebrating by giving the top-level Scirocco R some upgrades that Americans will never experience. First and foremost, the 2.0-liter TSI engine has been bumped from 261 horsepower to 280, which should make it even more fun to drive, not that I would know because I live in the U.S. and Volkswagen doesn't want me to have fun. The new Scirocco R also gets a revised front end, a rear bumper that "has been reshaped to appear lower and more purposeful" according to Volkswagen, and the 18-inch wheels from the Golf R. It should be extremely attractive to the European eyes that will gaze upon it. Things get better inside for people who aren't Americans, too! The dash has been upgraded with new gauges, including a top cluster that resembles the one you got on the 1970s Scirocco. As before, Europeans have their choice of DSG or manual transmissions, because Volkswagen just gives them whateeeeveeeeer they want because they're so darn special, don't you know. It's all for them! Everything is for them! I have to go to my crying place now.